The star of a few upcoming meals will have started with this dinner. 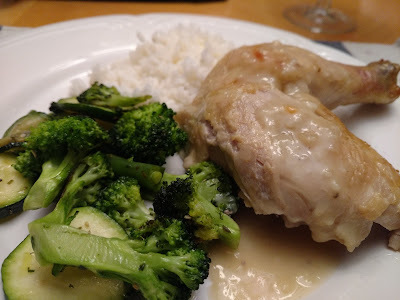 Lemon Pepper Roast Chicken in a Slow Cooker. This is definitely a favorite slow cooker recipe. Chop vegetables and add to a 6 to 7-quart slow cooker. In a skillet, melt butter over medium heat. Add flour and mix with a wooden spoon to cook the flour. Whisk in 1 to 1.5 cups of the strained chicken broth. Bring to a boil and allow to boil for 30 to 60 seconds. Add in white wine and stir. Simmer for 2 to 3 minutes and season to taste.